Although there is no cure for psoriasis, psoriasis treatments are needed (and appreciated) to soothe the skin. Winter in particular seems to bring dry, itchy skin along with its bag of weather goodies. And despite whatever layers you may be wearing, that cold air can really sneak inside, and may cause pain, dry patches and all kinds of irritation (which can actually worsen psoriasis symptoms). Thankfully there are a few easy, yet valuable tips for treating and preventing painful episodes of psoriasis. Psoriasis is an autoimmune disorder that’s baffling and persistent, and causes significant trouble for those afflicted. It’s not just a simple itch—the unpredictable flare-ups, dryness, and rashes hurt. Scaly and irritated skin can take your mind off what’s important, while leaving you in constant fear of when the next episode may arrive. It’s a multifaceted condition that causes both physical and emotional pain. Some even describe living with it as even more difficult than living with cancer. Yikes! Although there is no one-size-fits-all approach for dealing with psoriasis, there are some things you can do to prevent flare-ups, or to quickly treat them when they arise. Figuring how and why your psoriasis kicks in is central to dealing with this debilitating autoimmune condition and relieving the stress associated with it. 1. Discover your triggers: Try noting what you did right before, or what you’re currently doing when a flare-up hits. It might follow when you eat specific foods, wear certain clothing, or are in situations you find stressful. The fix might be as simple as avoiding certain types of food, not wearing clothes made from a particular fabric, or staying away from people who make you feel uneasy. 2. Get a little more sunshine: UV rays can help suppress skin inflammation, so sun exposure to affected areas can help ease the pain and prevent flare-ups. Limit your sun exposure to 20 minutes per day. If you don’t protect your skin after being in the sun for 20 minutes, you could get sunburn, which will just irritate your skin further. If you’re in a climate where you’re just not able to get enough sun exposure in the winter, look into getting a UV light for home use. 3. Identify and avoid stressors: Stress can play a big role in psoriasis cases. Although the links aren’t fully understood, it may have something to do with the effect of stress hormones on the immune system. If you can’t avoid your stressors, finding ways to deal with them is essential for psoriasis treatment. Yoga, meditation, talking to friends and family, and finding relaxing activities are all ways you can reduce stress to combat psoriasis. 4. 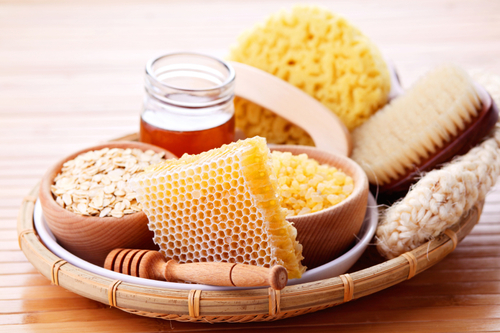 Take oatmeal baths: You can add uncooked oatmeal (NOT instant oatmeal) or purchase an oatmeal bath mix from a health food store to help treat psoriasis. Soaking in a warm tub with oatmeal can help loosen the scales caused by psoriasis and soothe flare-ups. Just make sure not to rub oatmeal flakes into your skin when drying off, as this can irritate your psoriasis. Instead, pat your skin dry very gently. Without a doubt, psoriasis could be holding you back from living life the way you want to. It’s an emotional condition just as it is physical, and it’s essential to find ways to live outside of its clutches. Try these tips to help keep your psoriasis in check and enjoy your life. “Psoriasis,” Mayo Clinic web site, June 17, 2015; http://www.mayoclinic.org/diseases-conditions/psoriasis/basics/definition/con-20030838, last accessed February 23, 2016. Tags: Psoriasis Treatment Natural, Psoriasis Treatments, Soothe Irritated Skin, Treat Psoriasis, What Is Psoriasis?